Terriers were originally bred to be small working dogs to hunt rats and mice, as well as other vermin. However, these breeds also developed a kind, intelligent nature, making them perfect companions for hunters and students alike. In fact, around the turn of the century, it became a fad for Cambridge University undergraduate students to own small ratting terriers. 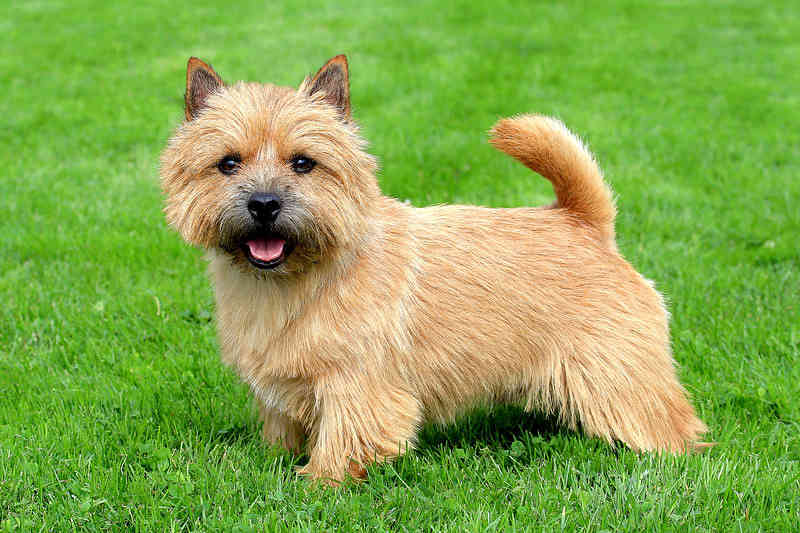 The terrier of choice became the Norwich Terrier, one of the smallest working terriers. With one glance at their short, stocky frame and their bright, intelligent eyes, it is immediately clear why the Norwich Terrier is so beloved as a companion both then and now. This breed was sired mostly by a small dog named Rags. Despite his simple name, Rags was a champion rat hunter and a plucky friend. He was generally intelligent and quick as well as affectionate, and this paved the way for the temperaments of future Norwich Terriers. Despite their small size, they are not easily frightened when meeting new people, dogs, or environments. Additionally, they are rarely aggressive towards other dogs unless socialized improperly. The Norwich Terrier will bark to alert their owner of a new person or situation but will not bark for long after shown this new person is a friend. Their hardy nature manifests itself in its physical needs. The Norwich Terrier has a high need for activity and would thrive with a healthy mix of obedience and agility training combined with games like ring stacking, hide-and-go-seek, and other games that will exercise both their body and mind. Earthdog trials were practically built for dogs like the Norwich Terrier. These tests have safely caged rats that the participating dogs find. After the dogs find the rat’s hiding place in a tunnel, they are rewarded with praise and treats. There are multiple levels of Earthdog training, and any would be a fun exercise for a Norwich Terrier. The same curious hunting nature that makes them Earthdog champions also makes them unsuited for leashless walks or unfenced yards. They should not be left outside alone, as they may chase squirrels up a tree or into the road. Even electric fencing will not bar them from chasing prey they deem interesting. Additionally, the Norwich Terrier is like its many cousins in that it loves to dig. It may be best to train your terrier to dig only in a specific spot on your property rather than trying to circumvent digging altogether. At eleven to twelve pounds and ten to eleven inches tall, this dog is a perfect apartment dog, although they would also enjoy a suburban home with a fenced-in yard. These dogs have a double coat which comes in a range of colors, including tan, red, and black and tan. Norwich Terriers require weekly grooming. This grooming should include brushing their fur with a wire comb and trimming any extra feathers or long fur between their toes. Additionally, their teeth should be brushed, their ears should be cleaned to prevent infections, and their nails should be trimmed. Their coat sheds, or “blows,” seasonally, and should be helped along by more frequent grooming during these times. Their coat also requires regular stripping. The Norwich Terrier has few health complications. However, like many dogs, the Norwich Terrier may develop cataracts, epilepsy, luxating patellas, hip dysplasia, and dental problems, among other health conditions. Additionally, like many small dogs, the small tracheas of Norwich Terriers are prone to collapse. Therefore, to prevent tracheal collapse, harnesses should be used to walk Norwich Terriers rather than traditional collars. The average Norwich Terrier lifespan is approximately twelve to fifteen years, making them a wonderful family dog that could grow with children, as long as when the dog is first brought into the family the children know not to play too rough with the dog. Norwich Terriers are easy to train, making them perfect for a first-time dog owner. However, although they are eager to please their owners, they may prove difficult to housetrain, especially when not given proper praise or treats. Ensure you are taking enough time to train your dog, as well as understanding the practical limitations of this small dog’s bladder. Their prey instinct may make them unwelcome roommates for cats or rodent pets, so homes with either of these pets may not be the best fit for all Norwich Terriers. A Norwich Terrier will be a perfect companion for an active, loving family. They are sweet and affectionate with their family, enjoying being at their side at all times. Bringing a Norwich Terrier into your family will bring many years of happiness to you and your family. Breeding Norwich Terriers is a difficult task, and the litters are often small. Future owners should take into consideration the cost of a Norwich Terrier, as well as contacting only trusted and ethical breeders to prevent genetic defects in their dogs.